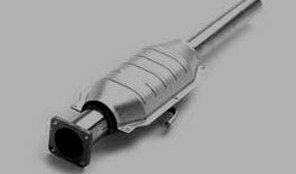 If you are concerned about fuel emissions then the catalytic converter is an integral part of the exhaust system of a vehicle. It is located in a housing along the exhaust pipe on the underside of the vehicle somewhere along the position of the front seats. Inside the housing of the catalytic converter are 2 ceramic blocks, each block has thousands of micro passages and they are coated with precious metals. The thousands of micro passages is to increase the surface area that the exhaust gases come in contact with as they pass through the converter. The first block is coated with platinum and rhodium and the second block is coated with platinum and palladium. The metal properties that coat the ceramic blocks have the ability to cause the exhaust gasses from the 4 stroke cycle to react, break down and re-combine in a different form to how they came in. The gasses that leave the engine and enter the converter are Nitrogen Oxide, Carbon Monoxide and in some cases the molicules of unburnt fuel. After passing through the first block the nitrogen oxide break down and become nitrogen and oxygen. The carbon monoxide and unburnt fuel remains the same. When the gasses reach the second block the carbon monoxide combines with some of the oxygen to create carbon dioxide and the unburnt fuel also combines with oxygen to create water. A picture of a catalytic converter. This process takes place in less than a second for a quantity of gasses as the exhaust fumes can pass through the catalytic converter very quickly. Some of the gases and molicules will escape this process and exit the exhaust as smoke whether visible or not. The catalytic converter must be hot to perform the conversions so whenever a cold engine is started the converter does almost nothing to convert the gasses, it may take over 15 minutes of driving to heat up the converter enough to perform effectively. The reason why the catalytic converter is a distance from the engine is because it generates too much heat that can damage the converter, but the heat from the exhaust won't damage it. The catalytic converter is similar to an engine in that it needs to be hot to work properly but if it gets too hot it will be damaged.